Max Cement celebrated World Environment Day with a tree planting program at its manufacturing plant. The program was inaugurated by Pawan Joshi, General Manager (Commercial), Max Cement followed by tree plantation and awareness program at the company premises. 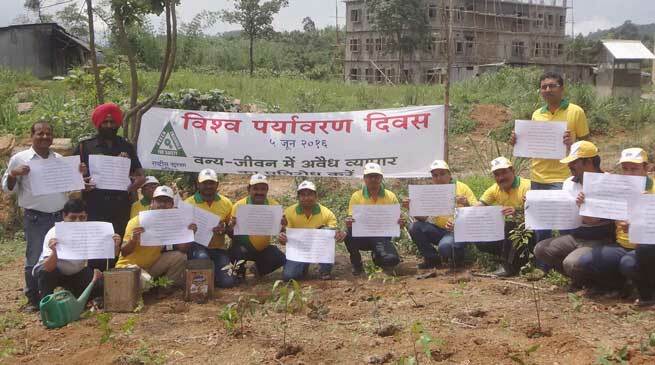 On this occasion Max Cement Plant employees and contractual workers planted 1000 saplings across the plant area and in nearby areas to reiterate their commitment towards environment and spread awareness on the need and importance of trees. Commenting on this initiative, Shri Vineet Agarwal, Vice-President & Managing Director, Max Cement said, “Max Cement has always been at the forefront of efforts to protect environment and is committed to sustainability. ‘Max Cement believes that there can be no sustainable economic development without the preservation of nature and tree plantation helps maintain environmental balance”, added Shri Agarwal. Moreover, a drawing competition was also organised at ladies club among the children with a theme “Environment Protection”. All the participants were savoured with consolation prize along with winners of First, Second and Third position. Max Cement is the one of the leading cement brand of North-east India and has several awards including ‘Emerging Company Award for quality excellence’ from Indian Achievers Forum, “India’s Most Promising Brand 2013-2014 in Infrastructure Category” by WCRC, “Power Brands Rising Star 2012” by Planman Media and “Most Promising Cement Brand Award” by local satellite news channel News Live. The success and dependability of Max Cement is credited to the 3Ss, which stand for STRENGTH, SETTING & STABILITY.